Maryland Gov. O’Malley commutes death row inmates’ sentences. 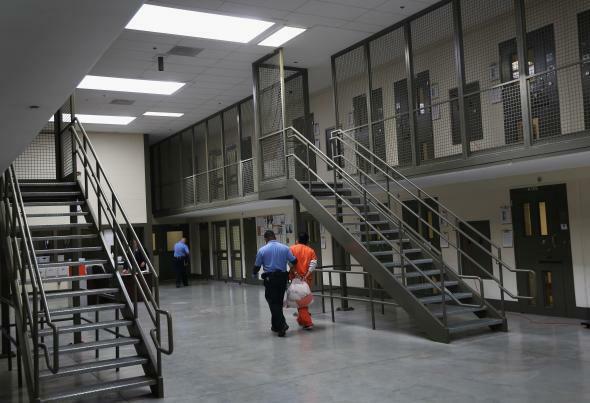 A prison guard escorts a detainee at the Adelanto Detention Facility in California. Maryland Gov. Martin O’Malley said on Wednesday he would commute the sentences of the last four remaining death row prisoners in the state. O’Malley, who is weeks from the end of his second and final term as the state’s governor, will reduce the death sentences to life without parole. The move means Maryland will no longer have any prisoners on death row. Maryland last executed an inmate in 2005. The state outlawed the death penalty nearly two years ago, but the repeal of capital punishment did not apply to prisoners already sentenced to death.